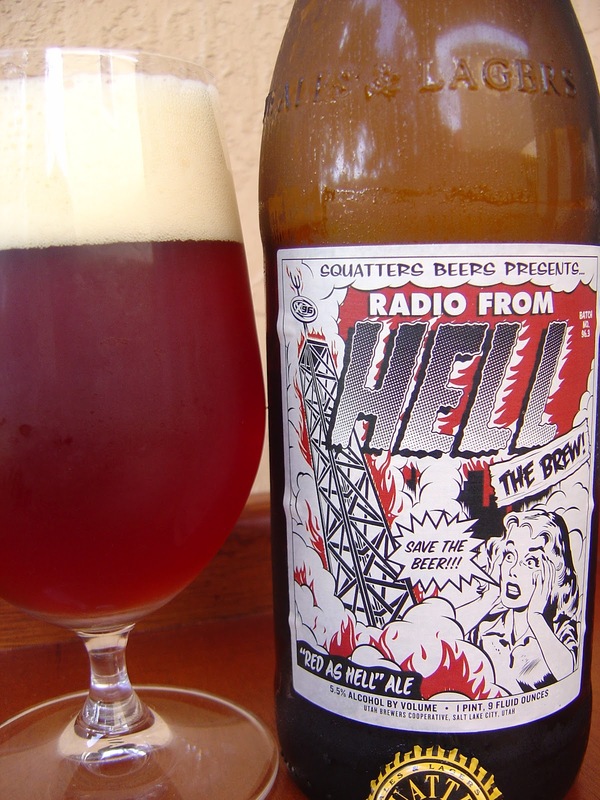 Today I'm drinking Squatters Radio From Hell "Red as Hell" Ale brewed by Utah Brewers Cooperative in Salt Lake City, Utah. I was sitting on my couch this afternoon minding my own business when the FedEx man rang the doorbell, looking for an adult signature. And I think you all know what that means, right? Yeah! There's beer in that box. This wine bottle happens to be a sample provided to me by the brewery. One day they will distribute down my way (or better, maybe one day I'll move to a better location). The label art was designed by The Mandate Press and has a theme that revolves around a radio program called Radio From Hell. The cartoon on the front shows a lady who is clearly upset that the fires and rampant destruction are going to affect their beer supply. "Save The Beer!!!" she screams as the radio tower topples over. 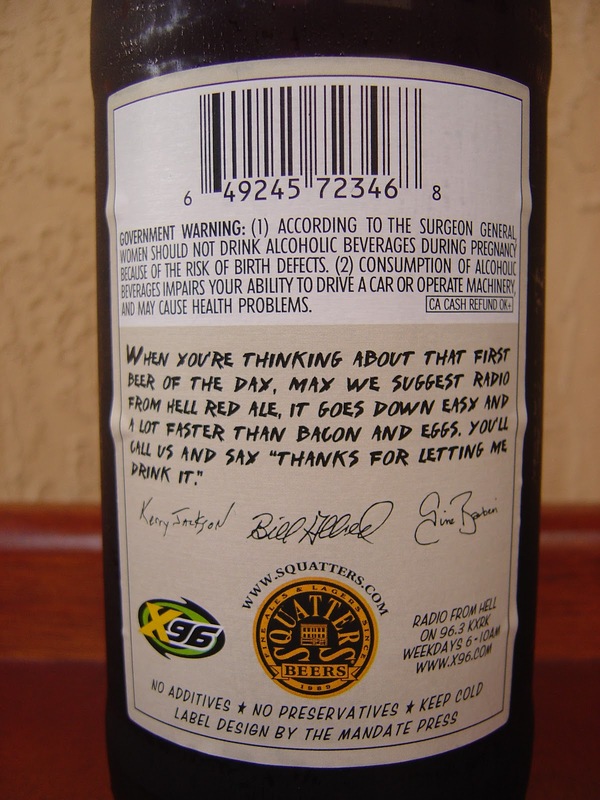 On the back label, you get a "first beer of the day" recommendation, signed by three people. Nope, not the brewers. These three are apparently the morning radio team from the actual radio program on 96.3 KXRK X96.com. So it seems we have a bit of a collaborative type beer. This is, surprise, Batch No. 96.3 of this beer. I think the presentation is very nice, including "Since 1989 Squatters Fine Ales & Lagers" stamped on the bottle's neck. Born 03/28/12. Sweet caramel aroma, with a candy-coated toasty scent also there, perhaps marmalade. Very nice. Sweet flavors, nice rich caramel malty base. There are then some herbal teal qualities and toasted malts. Nice texture, feels creamy in the mouth. Very enjoyable. The beer remains sweet as there is not really that much in the way of hops, but the sweetness is not overdone. Perhaps it wasn't intended for me to drink the entire wine bottle by myself. Hmmm. I guess I'm saying that if you are to drink more than two normal bottles or NOT share your own wine bottle, that might be your limit, based on the sweetness. The 5.5% alcohol is not much of a factor, though the finish is slightly dry. Nice body, straightforward flavors. Nice beer all around. I'll definitely be calling the Radio From Hell show to "say thanks for letting me drink it."